 Imagine, being able to reach out to dozens of domain industry companies and several thousand professionals at the same conference, who got together to share their products and services. Imagine, visiting company booths, collecting brochures in your backpack and talking to hosts and fellow attendees – all without setting foot outside your office or getting too far from your kitchen table. 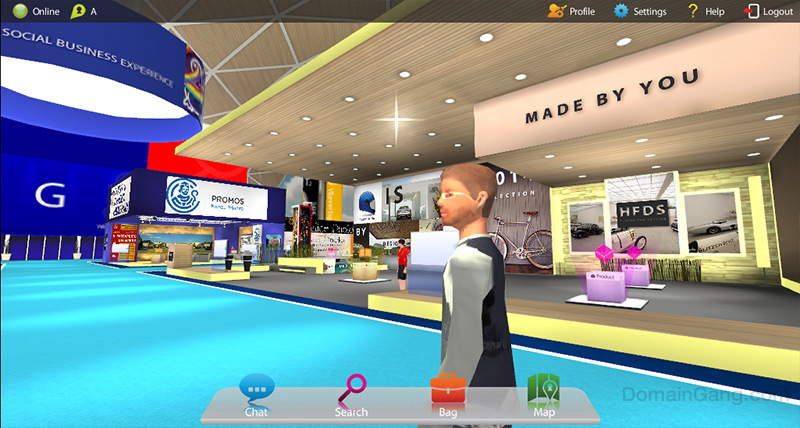 On July 24th, 2014 you will be able to do all this – and more – by attending Virtual Web Fair 2014; the first of its kind 3D virtual event encompassing the Domain, Hosting and SEO industries. Produced by Michael Marcovici of the Domain Developers Fund, the event aims to attract 5,000 attendees and dozens of exhibitors, using a revolutionary, interactive platform. 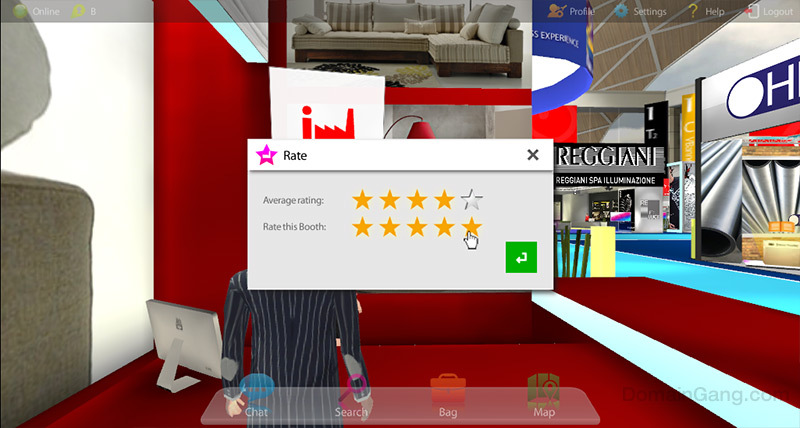 We were given an exclusive preview of the 3D platform and its virtual assets in its demo stage; the entire venue will be customized at launch time as a virtual representation of the Domain, Hosting and SEO communities, ready for you to roam around and interact with. Virtual Web Fair: At the pearly gates! 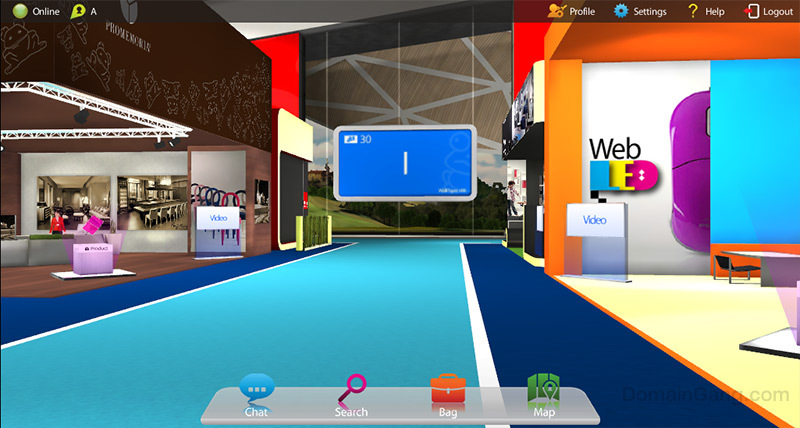 Once logged in, the necessary software is installed in your browser, the technology allows for multiple types of platforms and even tablets to connect. Once past the log in screen, you will find yourself at the lounge, and an overlay will show you the keys to use: arrow keys move you around, holding down the shift key will allow you to fast walk, if you are in a hurry. 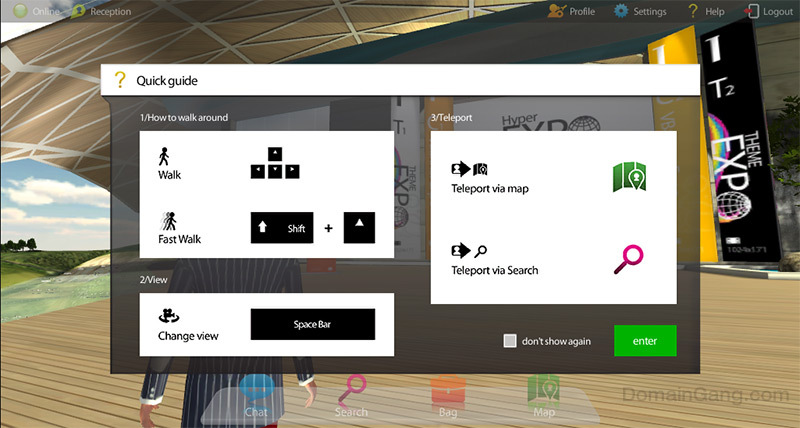 The space bar toggles first person / 3rd person view, and you have the option to teleport to your destination through a map or by locating the exact destination within the exhibit via search. Virtual Web Fair: Welcome to the Virtual Web Fair! If you keep the 3rd person (default) option on, you will be viewing your very own back, dressed in the default outfit. 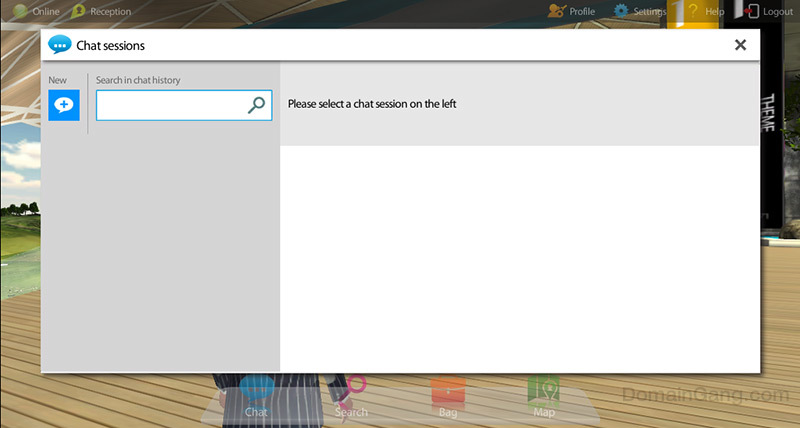 A small panel overlay displays four additional options that are accessible at any time: Chat, Search, Bag, and Map. At the top of the screen, the indicators on the left show whether you are online, and your location. 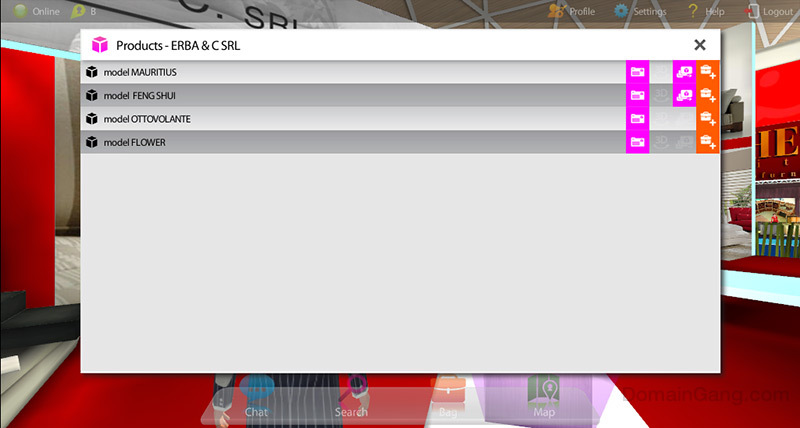 At the top right, you can click on Profile to view or edit your details, or on Settings to customize other parameters. There is also an option for Help and to Logout from the venue. Virtual Web Fair: Build your own avatar! By clicking on the Profile option, you can customize your look, which will be exactly how other attendees will see you as – so pick the one that matches your looks and personality. Obviously, the gender is defined at registration time, so no sneaky gender-bending is allowed. You can enter your name, email, company name and address and thus save this as your virtual business card that will be shared with the other attendees. You also customize the style of clothing – business or casual – and then select a face that best matches your race, hair style and also your clothes. 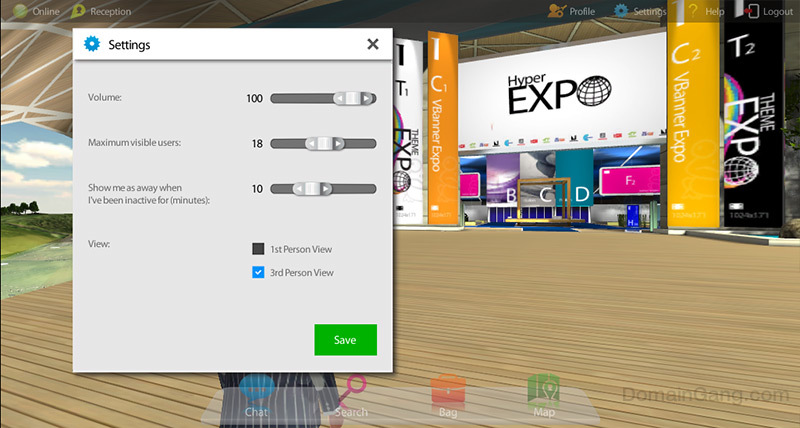 Virtual Web Fair: Tweak your settings for the maximum experience. If you click on Settings, you can adjust operational parameters, such as the volume of alerts and sounds, the maximum number of visible users within your immediate vicinity, an option to appear as “away” after a preset period of time, and a toggle switch for first person / 3rd person view. 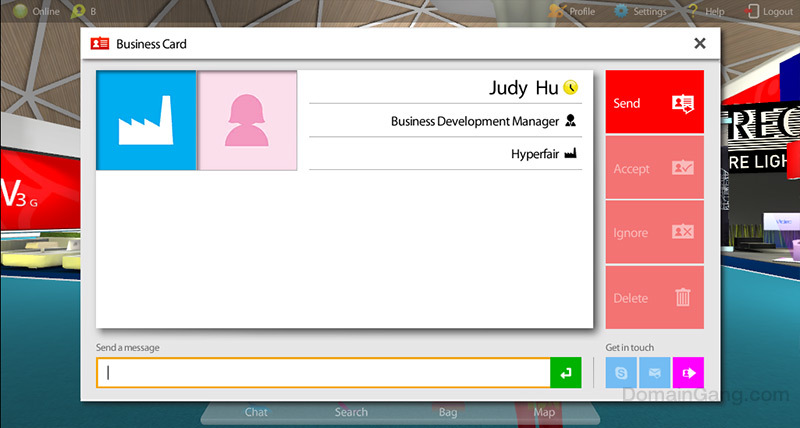 Virtual Web Fair: Chat is how you interact with others, including attendees, vendors and staff. From the personal panel, you can initiate a Chat (text) conversation with others that are online or that you have exchanged greetings already. Definitely a great method to keep up with many conversations at once! 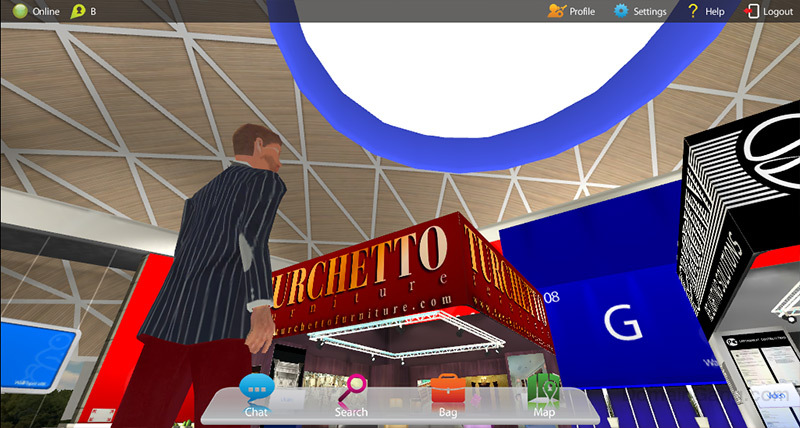 Virtual Web Fair: Search and you shall find. The Search option will provide you with tabbed segments of People, Companies and Products that you can locate and further interact with. 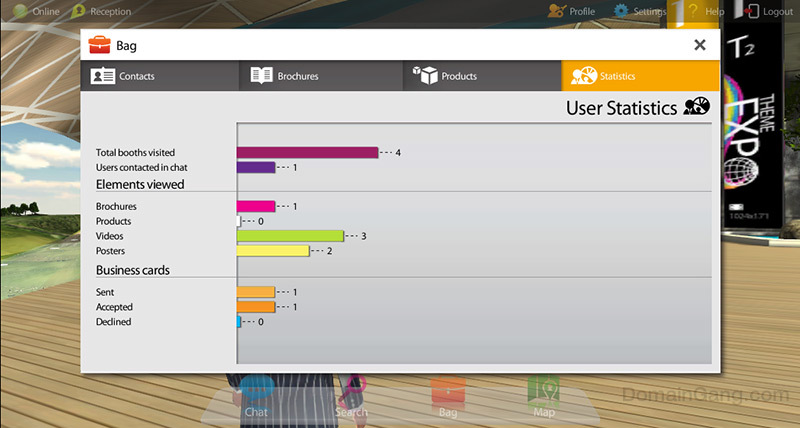 The interface allows you to quickly locate this information as needed, all while the activity continues in the background. Virtual Web Fair: You can definitely put all your virtual eggs in one basket. The Bag option is where you store your Contacts, Brochures and Products, as you roam from exhibit booth to exhibit booth; you can pick up PDF files and JPGs, URLs and business cards, everything is stored in your Bag. There is also a nifty stats tab that shows you how full your Bag is, but don’t worry, it won’t get full. 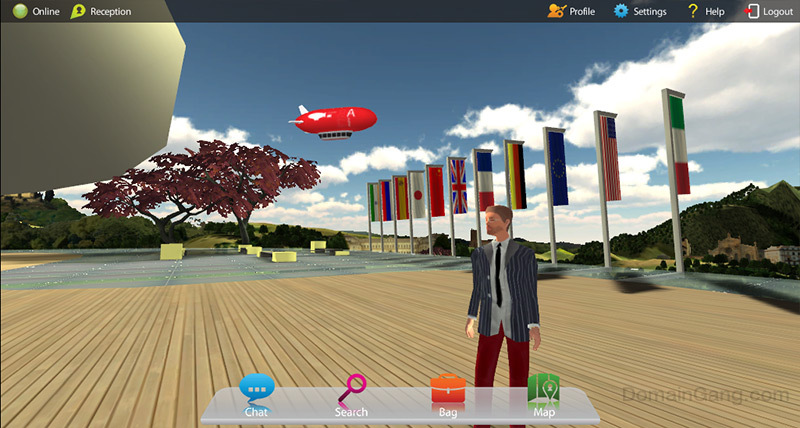 Virtual Web Fair: Beam me up, Scotty. If you click on the Map, you can view where inside the venue you are currently located. You can also transport directly to a particular section or exhibit, if you don’t want to walk around – but then, you might miss out making a great contact along the way. 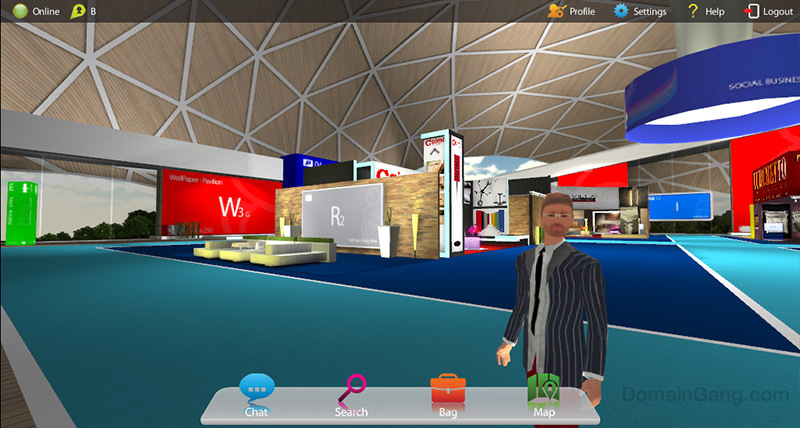 Virtual Web Fair: All dressed up and ready to enter the venue! 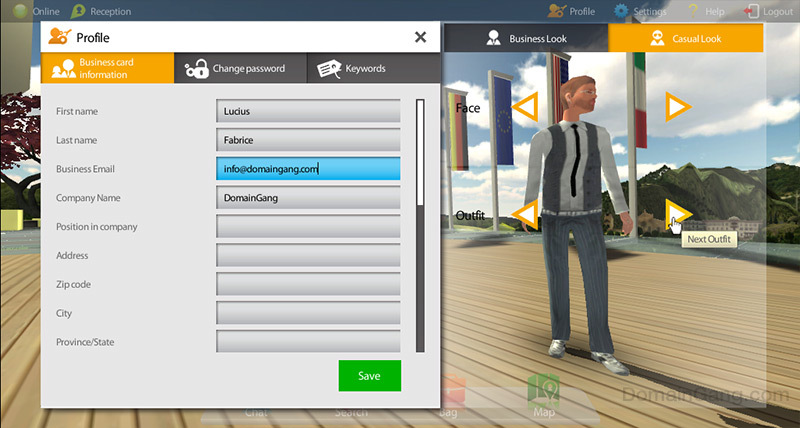 Once you’ve customized your settings, you are ready to enter by walking through the entrance. Take your time and explored the exhibits, as if you were there in person. Hundreds of others will be doing the same thing, stop by and say hello. 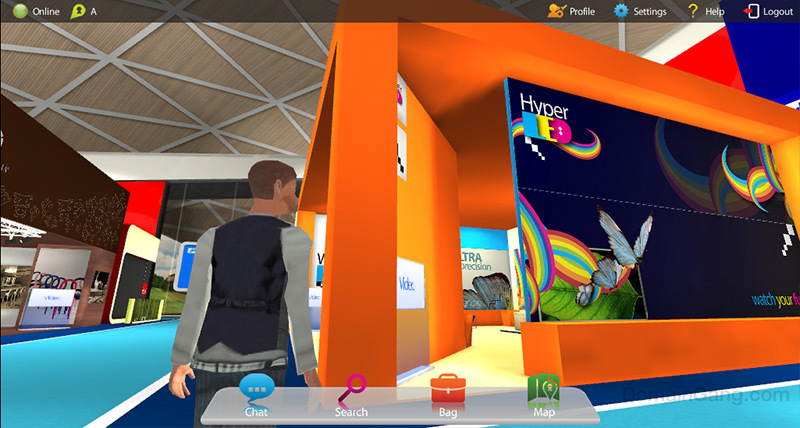 Virtual Web Fair: A world made of colorful banners. Once inside, the hallways will be full of people walking by, stopping at exhibit booths and picking up product information from the booth assistants. In our demo, the wall surfaces are marked for their function and their dimensions in pixels are marked to indicate the size of commercial ad space that will be displayed. Get ready for a cornucopia of creative visuals! 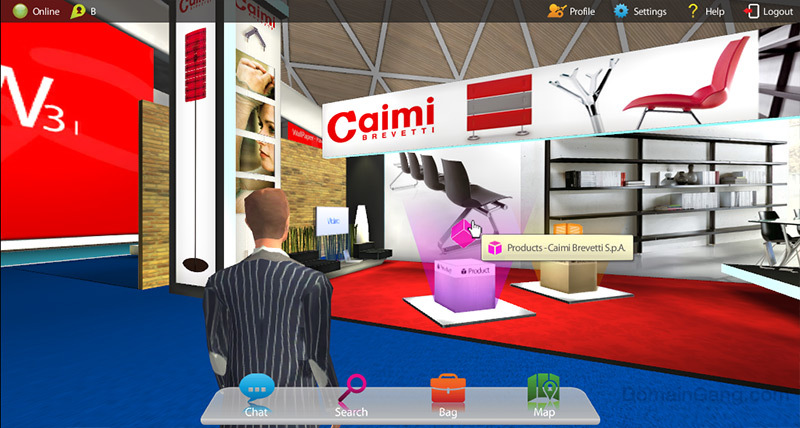 Virtual Web Fair: At a booth, perusing its products. 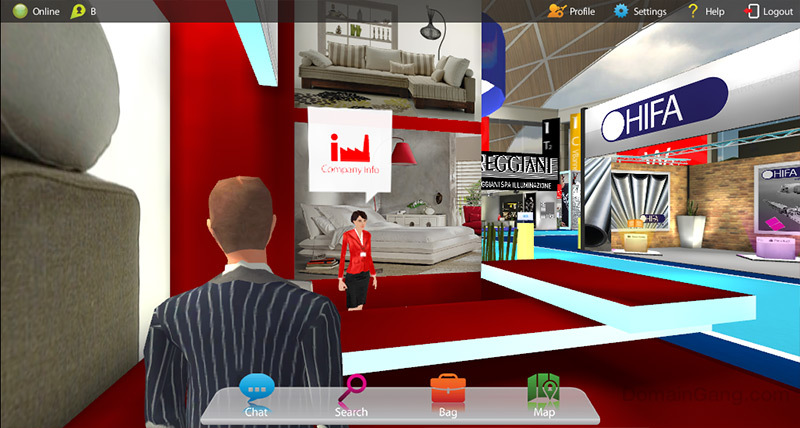 The current demo is built around a furniture industry expo and here we are about to learn more about the particular brand and its products. The helpful assistant is waiting to answer our questions; it is, after all, a real person staffing the booth – so be nice. Virtual Web Fair: Let’s fill our bag with goodies. 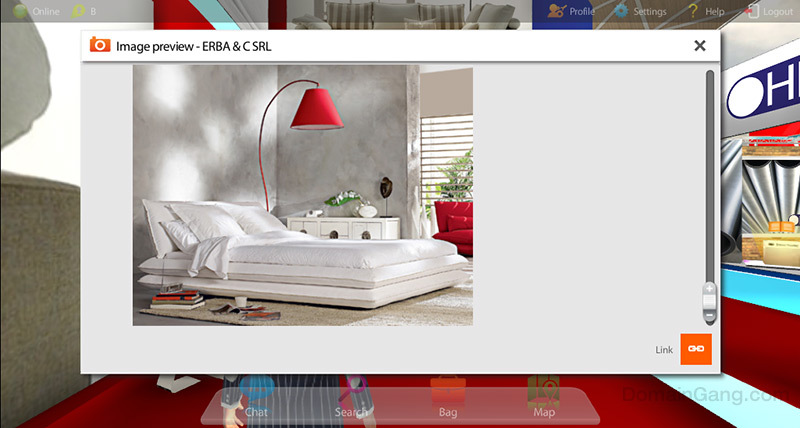 By clicking on a product, you can view its available materials: info (click to view), photos (click to display) or brochures to click and store in your bag. You can then view them individually, either at the spot or at your leisure, later. Virtual Web Fair: I think I like this couch. 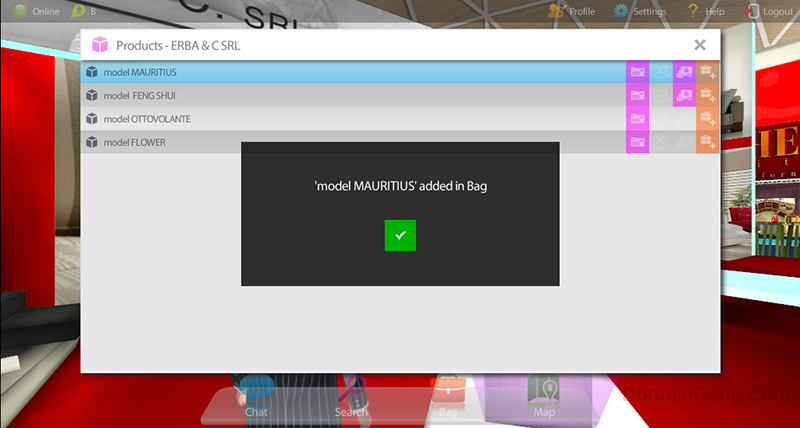 By adding a product brochure to your bag, you store it for later view and a helpful confirmation dialog pops up. Virtual Web Fair: Let’s say hello to the booth operators. You can get up close to the booth operators, and further interact with them in person. Virtual Web Fair: Click on the info balloon for more company info. 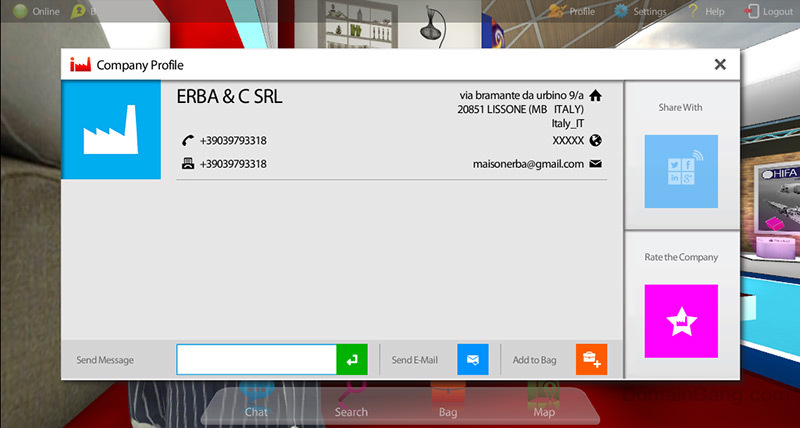 Once at close range, you can click on the information balloon of the booth operator, to learn more about the company. There are several actions that can be performed at that stage, from sending a message and email, to saving the contact info in your bag, where it will be added under your Contacts tab. You can also share the info on various social media such as Twitter, Facebook, LinkedIn and Google+. Virtual Web Fair: If you’re happy, share it. From the same screen, you can leave some feedback about the company and their presentation, by clicking on the Rate the Company option. Go on, give those hard working folks five stars! Virtual Web Fair: Are you tired already? Certain products produce images, and in this case you will be able to view a bed in larger detail. 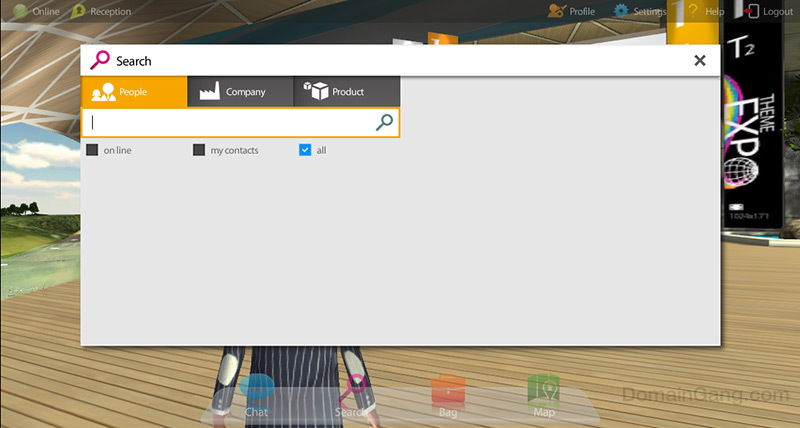 You can also click the link option on that overlay, that will open the product in a browser window. Virtual Web Fair: But is she looking at me? The booth operators are programmed to display mannerisms of real people; they are, after all, real people whose function is to act like real assistants would. Say hello now, don’t be shy. Virtual Web Fair: Feel free to roam! Walking around, or fast walking if you feel rushed, is fun. You get to explore the various booths of the venue, and go from one to the next without getting lost. 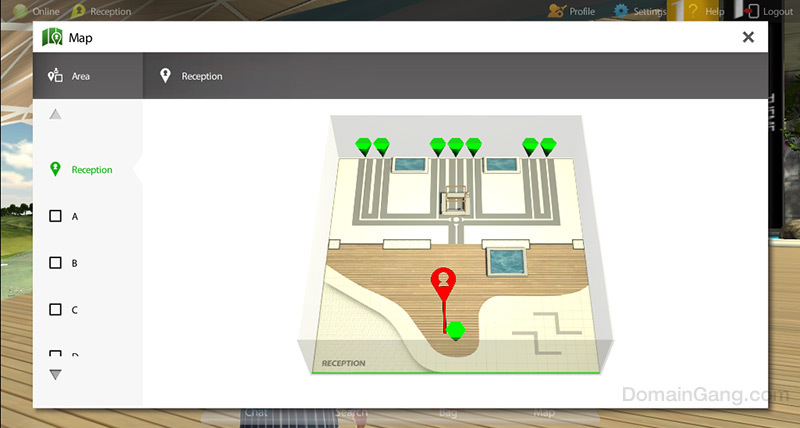 You can always consult you map, but be prepared to meet some exciting attendees along the way and interact with them. Virtual Web Fair: More products, will your bag ever fill up? Your bag will not fill up, and you won’t get bored either. 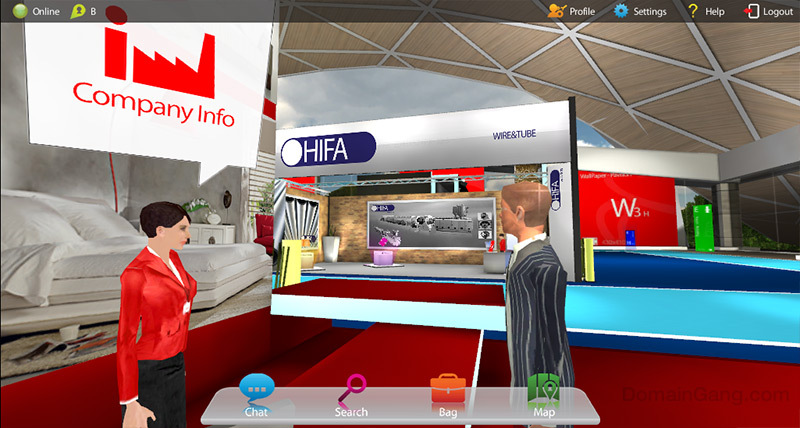 You can use your mouse – by clicking and holding as you move around – to explore the Virtual Web Fair in full immersion, and 360 degrees of viewing field. Virtual Web Fair: What are those banners all about? In this demo preview, we experienced the venue as it exists for demo purposes; here is an example of a wall that will be fully dressed in corporate colors and banners, right on time for the Virtual Web Fair in July. 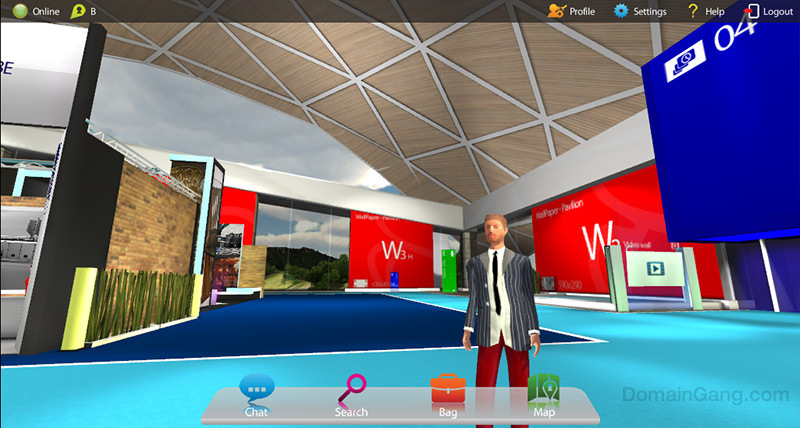 Virtual Web Fair: Looking sharp! You can change your appearance at any time, if you’re tired of your current outfit. While you won’t be able to sit at the comfy couches seen on the left, your physical posterior will be sitting on your office chair for the entire length of the Virtual Web Fair. Virtual Web Fair: Talking to others is a cinch. Interacting with people at the conference is a cinch.  Just click on their name and you can chat via text, exchange – or reject, even – a conversation and business card, and even initiate a video conference via Skype! Now that’s where it’s getting really interesting. Virtual Web Fair: So many things to see, so little time. The Virtual Web Fair is a single day conference, but you will have the entire day to spend at the comfort of your own home or office. It is a unique opportunity to utilize technology for a business function that normally takes a lot of physical effort – not to mention expensive admission fees. At the time of writing this article, the Virtual Web Fair organizers are getting ready to change its admission fee from $39 to an even lower price! 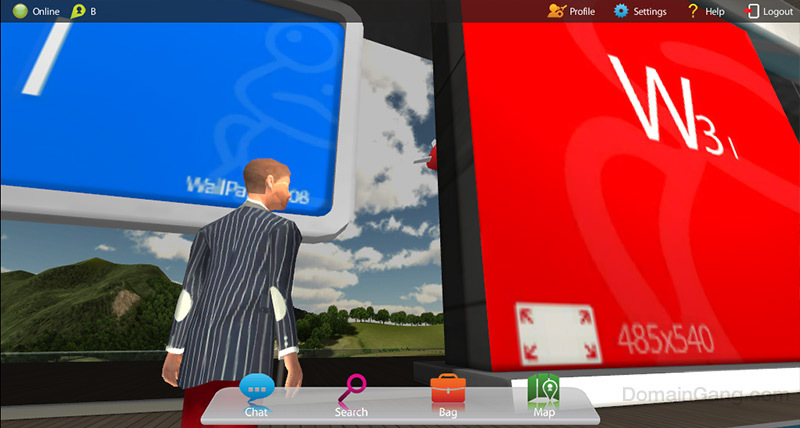 Virtual Web Fair: Look at the walls, they come alive. The amount of interactivity with a variety of elements is definitely immersive. You can click on an animated video wall and view the actual video in an overlay. Virtual Web Fair: Watching movies is easy. On that overlay you will be able to adjust the video controls and watch a product presentation or other type of video as prepared by the booth operators or the venue. 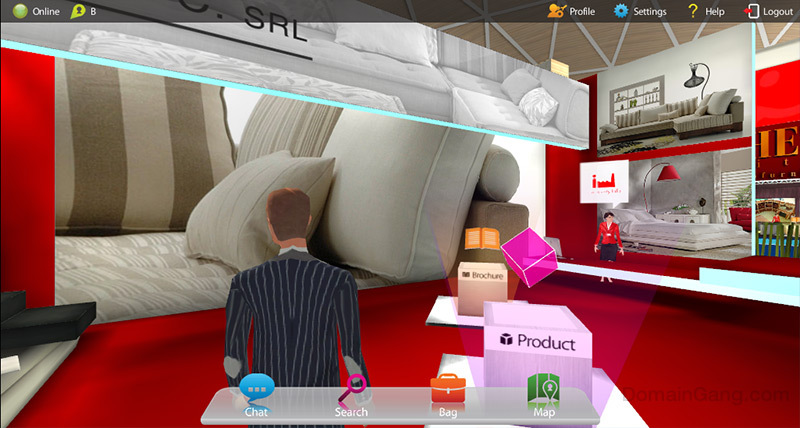 Virtual Web Fair: From the 1st person perspective. The entire experience is expected to be amazing; simply by demoing the venue we were left hungry for more, and we will be attending – no question about it! 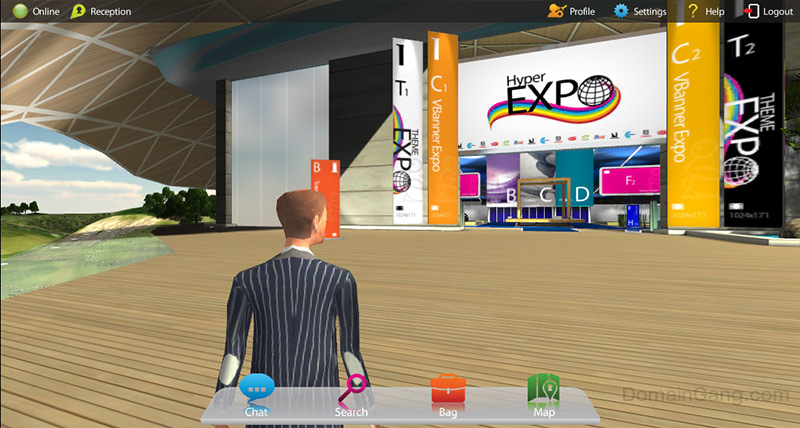 What sets the Virtual Web Fair apart from real conferences is the amount of user and vendor interactivity that can be achieved in a very short period of time, all from the comfort of one’s office or home. According to the event organizers, there is no real limit to the maximum number of attendees at any time, and there is no need for a really fast Internet connection. For more information, visit the Virtual Web Fair web site and get ready to be blown away. Many thanks to Michael Marcovici and Cameron Anderson for the exclusive preview. See you in July! Everything is now virtual. I just see we are stepping into a world of virtual relations, virtual, jobs and etc.